We want you to be a part of our community unified by a mutual love of adventure, and desire to be stronger than the challenges we face. Our job is to fight learned helplessness, why not join the pack? Sign up to join ISG. Our goal is to provide actionable, contextually relevant solutions for any problem to enrich lives through skill and adventure, and to encourage thoughtfulness and experience. Support us on Patreon to keep your experience Ad-free. Get all the latest content first. Chances are you already know that trying to shoot two long guns at once is a bad idea... we tackle the topic from a rational perspective in "Dual Wielding". Well, ISG, we're back. This time, with an article that we never thought it'd be necessary to write. Before we get to the meat and potatoes of why trying to shoot too long arms at once is absurd, we should admit that "bad practice" was never meant to be a series. Our general policy is 'focus on the good'. With experience, you tend to start noticing bad practice on your own, and that's *far* more powerful than simply being told by some random internet guys that what you're doing is wrong. Also, the internet is so awash with weird, outlandish, and just plain stupid gun handling that it could be a full time job... so we try and stay out of it. But along came "level-three Army combatives instructor", Shane Jordan of "Wyatt West Tactical" with some techniques so bad that we thought they were satire. When we thought this was satire, we loved it. It seemed like a perfect commentary on the chicanery of internet gun culture, but then Shane, the owner I guess you could say, of Wyatt West Tactical, contacted us to let us know that he was indeed serious and asked us if we could explain why it was wrong. Our hat is off to him for putting himself out there like that and standing up to us fossils who still don't believe dual wielding long arms is practical. So first, let's have a look at... well... whatever this is. (The Grand Vision) is to be able to switch guns on the move. I want to switch from an AR-15, to a tactical shotgun, to a handgun very quickly!! I also want to be able to get past almost any obstacle with my weapons on my back and completely out of my way. I want to be able to have the option of sprinting with both arms by my side. When you play a first person shooter game your character switches guns from long range to close range weapons very quickly like in Call of Duty for instance...Video game characters got skills can we match them? Besides not having the decency to turn his camera sideways while filming, we've got a video game-inspired back mounted sheath with the singular function of allowing you to carry an extra shotgun at the cost of a backpack. We also don't believe that he became a level 3 combatives instructor in 3 years, but whatevs. What's a little stolen valor between tropes? The upside to this technique is it comes with a bungee system that helps support both of the long guns (patent pending, guys, it's too late), so you can fire them at the same time. And here we thought it was just for a video game fast transition between firearms! The only problem we see is he hasn't yet found a way to get a third arm for the handgun, so we can tri-wield. Roast aside, we're not sure what situation you're preparing for, but within our framework of Understanding Emergencies, and given the fact even need a single long arm is pretty rare, we'd much rather have a backpack full of supplies. Secondarily, there's not much use in transitioning from a high capacity rifle to a low capacity shotgun that we're aware of. In our view, this diminishes the reality that most rifle fights go well beyond the range at which your shotgun would be effective. 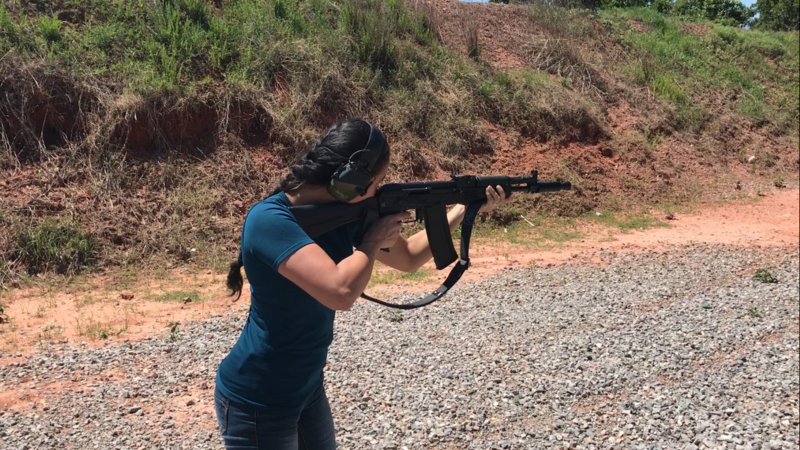 When they are under 25 yards or so, you have very little time to fool around with transitioning weapons - especially if you're on your own... and that's before discussing why this is a poor idea from a physiological perspective. Note the points of contact: firing grip, support side grip, shoulder pocket, cheek weld. These are all critical to the long arm's accuracy. One of the most necessary ingredients of marksmanship is consistency. Coupled with good tactics and the ability to maneuver, marksmanship helps us to ensure when we close the distance with our enemy, we don't find ourselves dosed with lead by hitting what we're aiming at first. Our grip on the weapons fore-end that adjusts for fine variations in aiming. The seating of the rifle in the shoulder pocket; the torso is used for 'gross' motor adjustments to aiming. Our cheek's index on the rifle that ensures we're able to quickly and consistently acquire our sights. Of these, the final point is the one that is given the least play, and deserves a bit more credit. Finding your target through the sights quickly is a strong indicator that you've mastered many of the physiological tasks that come with marksmanship. Your body is able to align itself in a consistent manner that minimizes time spent trying to track your sights once you've brought the weapon to bear. Have you seen someone who just flops with no real effort made to coordinate their effort? How about someone who's careful and graceful about how they lower their body? Which one has better physical conditioning and proprioception? Us too, kid. Us too. When we sit down, we typically have a goal in mind. We're going to have dinner or read a book. Maybe we're going to write an article about weird stuff on the internet. When you do that, the end goal isn't sitting - it's the task that comes next. What Shane is doing here is the equivalent of flopping into the chair because it's the fastest way to sit. He's emphasizing the process over the end result. It wrecks his posture for the more important aspect of drawing the weapon: the next task of firing accurately. So of our main tasks in a fight (maneuver, shooting, communication), he has managed to handicap two, and the only thing he's communicating is that he has no clue what's going on. So I can pin you down and pull out my secondary weapon, when close. Like if i'm coming strait at you. I can come around a corner with 2 weapons drowned. Also I can hit the lock on your door when clearing a building quicker, and hit 2 corner at ones. What we want is the greatest possible amount of control over the firearm as possible in every given way. Techniques that compromise that must be assessed for soundness... for example, holding a flashlight in your offhand while holding a pistol compromises your ability to fire as accurately as you otherwise might... but it allows you to see. Fair trade. What we've got here isn't a fair trade. 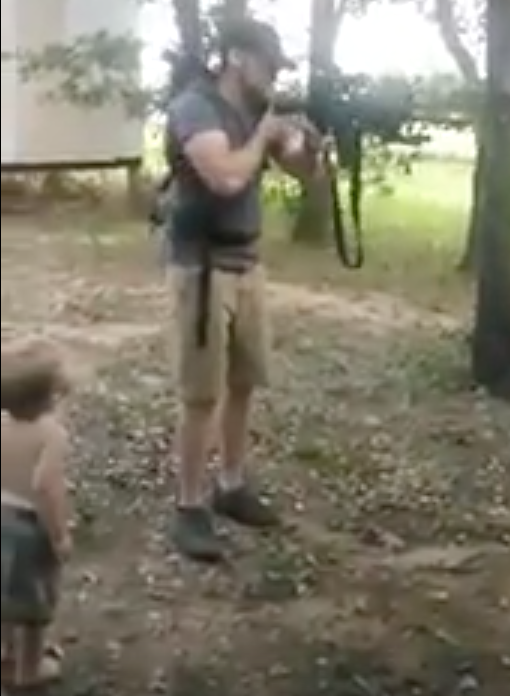 Every person who posts a gun video of any sort is going to be handing information to people who don't think you should have guns, or handing information to people who don't know what to do with their guns. The mockery and trash talk might be funny, but at the end of the day it doesn't describe why something is stupid. That's important from a cultural perspective; if we can't explain why something makes sense, we aren't any better than the guys speculating based on video games. Every time you move, it should be deliberate, efficient, and with your eye on an end goal, not just a race to some spasm of irrational pageantry. As we told Shane, this is the weirdest of the weird and we can't imagine it getting you anything short of killdest of the killed. Still, whether or not we reach the proprietor of this technique, we've tried to explain the intellectual framework for why this is stupid, rather than just claiming we know better without being able to follow through with reasoning. Get all the newest articles sent to you first. The ISG Weekly Information Summary: An unbiased look at the happenings around the globe, and how they could impact life closer to home. April 22 2019. There's some silly junk out there with guys training to use their knife and firearm in a close range fight - at the same time. Why is that bad practice? Often, discussions of medical equipment center around wound packing, tourniquets, and chest seals... but what are we missing when we skip straight to trauma? The ISG Weekly Information Summary: An unbiased look at the happenings around the globe, and how they could impact life closer to home. April 15 2019. The ISG Weekly Information Summary: An unbiased look at the happenings around the globe, and how they could impact life closer to home. April 8 2019. Prevent kidnapping and protect yourself with these facts and approachs to train your family. Prevent and detect threats before they happen. There are some practices that are deeply rooted in problematic tactics. We look at the "Tactical Wobble" today, and why it'll get you killed. Painting your rifle is more than just a move to emulate the cool guys - it actually has some practical benefits. Learn more about how to set it up right. At ISG we pride ourselves on being different. Why? Because we believe "be prepared..." is an incomplete sentence. Find out how to finish it. The worst case scenario for most people is illegal detention by criminals or hostile states. We discuss some myths and consideratons about E&E. Ever wondered what happens when a community takes a hurricane on the chin? Michael Jenkins shares his story... and it's not a survival fantasy. Ever wondered why it's not a great idea to strap a gun to your baby, and your baby to your chest? Neither did we until we saw Mike Warren. Here's our rebuttal.